This entry was posted on Sunday, March 22nd, 2009 at 11:05 am	and is filed under Maple Syrup and Sugar, Vegetables. You can follow any responses to this entry through the RSS 2.0 feed. You can leave a response, or trackback from your own site. Yum! 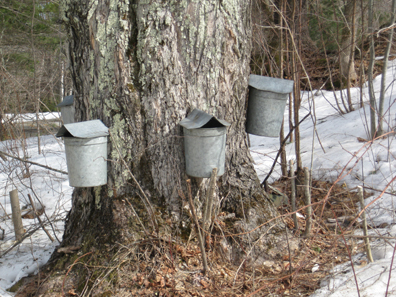 And it is just starting the maple syrup harvest season! I think folk science is the perfect analogy for cooking. I am a chemist myself and am constantly amazed how similar cooking and chemistry are. The difference though is that with cooking, I can express myself – I see it as an art form, where creativity rather than exact measurements and following directions is the main rule. We are all constantly learning and tweaking recipes to make them our own, and no food is properly enjoyed if it is not shared with others! Well put! Thank you, Jenn! Five years ago, I went to a sugar camp in New Brunswick. It was neat, and I remember them pouring tree sap onto snow (separated from what was on the ground), and getting to put the sap on sticks and eat it (did that make any sense?). It tasted very good. I love sugar on snow–but it’s one of the few foods in the world that is really too sweet for my digestive system. I like the idea of the sticks, though………. Wow, you have an awesome blog! I have enjoyed reading several of your blog posts tonight and look forward to trying a few of your recipes! 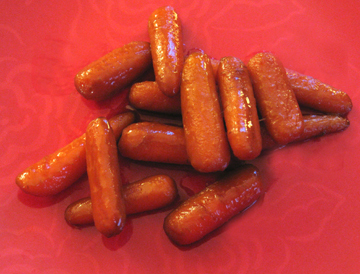 I love maple glazed carrots! It was the only way I could get my kids to eat carrots when they are little! Now they love them…but ONLY if they are maple glazed! Thank you so much, Shelly! Stop by any time. I’ll be doing my own key-lime pie next month (I saw one on your blog); maybe we can do a taste-test comparison………. Do you mind if I add your blog to my list of links on my blog roll? I’d be honored. Thanks, Shelly! Other readers might like to check out Shelly’s blog, http://wahmshelly.blogspot.com. She’ll guide you through cooking and even buying Tupperware (she’s a gentle but enthusiastic seller)………. Though Pam does most of the creative cooking around our house–and collects recipes as one might pearls– I look forward to your posts as eagerly as she does. Your little “introductions” are a delight, fun to read, and invariably give a lift to my day. The analogy between cooking and folk songs is perfect, and particularly appropriate I think in the context of boiling sap into syrup. What a lovely blog. I’ll have to put you in my “Favorites” list. Cooking is one of my big-time passions – along with devouring books. Books are less fattening, but sitting down to read doesn’t burn as many calories as kneading bread. Oh dear. Of course, I could then get on the treadmill, prop the book up, and eat warm bread with butter at the same time. I’ll have to work something out. Anyhow, great blog. I’m not sure I could handle all the hands involved in your treadmill idea, but I applaud it! I have added your blog, the Curious Reader, to my blogroll; I love connecting books and food!